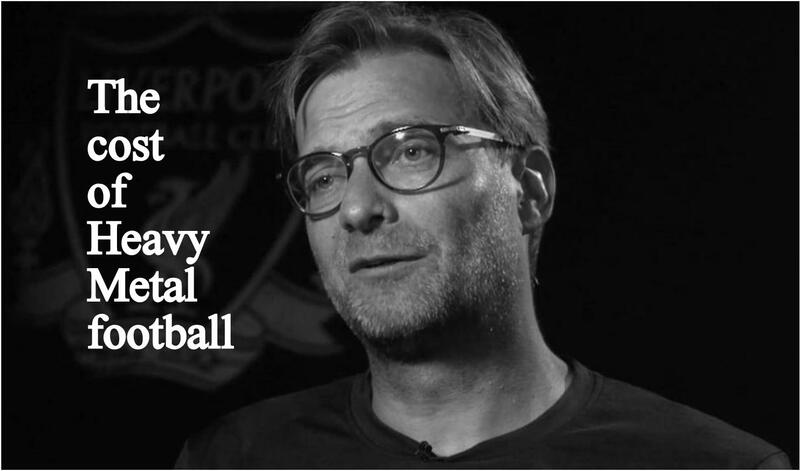 Imagine this: Iron Maiden blaring on the large speakers at Anfield at high volume while Liverpool use their pace and pressing to slay opponents in front of a hysterical crowd jumping in the stands and an animated Jurgen Klopp screaming until his lungs give out and his voice becomes hoarse. It is not a subtle image to have in mind but this is the style of football that Jurgen Klopp prefers. Back in 2013 when Dortmund were to face Arsenal in the Champions League, Jurgen Klopp had famously said about Arsene Wenger, “I think he likes having the ball, playing football, passes. It’s like an orchestra. But it’s a silent song. I prefer heavy metal.” Although this comment may not be an indication of his taste in music, it heavily implies the taste that he has in football. Historically, such a style of football has lead to a major problem in defence for the German. The same problem is seen continuing at Liverpool FC. Jurgen Klopp’s Liverpool defence is the area that has become a pressing issue for the club. If this is addressed, it could turn Liverpool into title contenders. Goals conceded by Jurgen Klopp’s teams in each season. Jurgen Klopp’s managerial journey has lead him from Mainz 05, his club of playing days, to Borussia Dortmund and then to his current club Liverpool FC. A look at his managerial history is enough to present a strong case that Jurgen Klopp’s team, though incredibly effective and active up front, have often fell short at the back. Klopp’s brilliance lifted Mainz 05 from 2nd tier of German football and earned them a sport in top flight in 2004-05 season. But the following 2 seasons in Bundesliga saw his team leak 55 and 47 goals respectively. The 2006-07 season saw them being relegated after conceding 57 goals. His seven seasons at Borussia Dortmund were nothing short of success, but his side had conceded more than 40 goals in three of his seven seasons at the club. His second season at Liverpool has seen the same amount of goals being conceded as his last season at Dortmund. An eerily similar trend is seen when the club track record of title winning managers is compared with Klopp’s record. The statistics of Klopp’s side pales in comparison to that of the heavyweights in football management in terms of defence. Barring Zinedine Zidane and Jurgen Klopp, no manager has conceded more than 40 goals a season on average. Zidane, who has managed only 1 complete season at Real Madrid so far could be excluded from the equation owing to his recent run of success. This leaves Jurgen Klopp as the lone manager with average goals conceded running into 40s. A leaky defence is one of the major reasons that Klopp’s side loses out on a title challenge. Average goals conceded per season by top managers in each club Vs Jurgen Klopp. Jurgen Klopp has won a league title as manager so far in each season that his team were stronger at the back and conceded less than 30 goals. This is enough to understand where the change needs to happen for Liverpool to challenge in England and Europe. Liverpool have won just 1 game since August 27 and have shipped out 14 goals since then, drawing 4 games and losing 2 games in the process in all competition. They are currently third from the bottom, on the list of goals conceded so far in the Premier League (12) and have let in more goals than the three newly promoted teams to the Premier League. These are alarming statistics that show that behind the strong attacking prowess of Liverpool lies a fragile defence that is penetrated with ease by opponents. At Liverpool, Klopp has a win ratio of 50.67%, less than Brendan Rodgers who sits at 54.67% in the same number of games. The 5-0 loss at the hands of Manchester City was a wake up call for Liverpool. Manchester City capitalised on Mane’s red card to trash Liverpool but this doesn’t conceal the fact that Liverpool have an inept backline. The loss at Etihad was followed by a a below par performance in Europe when Liverpool drew at home against Sevilla FC and drew in Russia against Spartak Moskva. Easy wins have gone begging for Liverpool this season owing to a leaky defence. The problem being faced by Liverpool in defence boils down to two major reasons: a lack of available leader at the back and Klopp’s Gegenpressing style. Gegenpressing is a tactic adopted by Jurgen Klopp where the opponent is overwhelmed by counter pressing in an aggressive manner when possession is lost and to counter attack in a flash to catch them off guard. The idea is to win the ball back high up the pitch to mitigate an opponents attack and this aids in a rapid shift from defence to offence for Jurgen Klopp teams. In 2012, Jurgen Klopp had admitted to being a fan of the style saying, “Gegenpressing is the best playmaker in the world.” But the team adopting such a style need to have players in the right position to press the opponets and close them down yet not be too close to be caught out of position. This style lays complete emphasis on attack and has pushed the full backs in an advanced role. This is what makes Liverpool defence so vulnerable. A quick counter by the opponents or a ball over the Liverpool defence could catch them off guard. A balance is required on the pitch for the Reds which provides an equal importance to defence or to bring in world class defenders who can cope up with Jurgen Klopp’s demands. ManCity catch Liverpool defence off guard to score the opening goal at Etihad on September 9, 2017. Talks of Van Dijk joining Liverpool were doing rounds during the summer but the close of the transfer window has seen Liverpool miss out on signing a good defender. On August 6th, Jurgen Klopp had said, “We have four centre-backs. I don’t think we need more. Just at the moment I’m fine. The transfer market is open until August 31. We cannot force the things and we would never get a centre-back just for the sake of it.” The comments might have seemed right to him at the stage but judging the state Liverpool are currently in, it couldn’t be any farther away from the truth. Liverpool do need a world class defence in order to compete for any trophy. Eckhard Krautzun who was Klopp’s predecessor at Mainz said about him, “It would be his dream to go to England one day and his favourite club would be United. That’s what he said.” Even though Klopp was quick to dismiss these comments as false, he would have to show no mercy when Manchester United visit Anfield today. Both Jose Mourinho and Jurgen Klopp would be trying to second guess each others’ tactics in a bid to stay in the title race. With such a shoddy defensive record, Mourinho’s men would try to exploit the Liverpool weakness to dominate at Anfield. The absence of Fellaini and Pogba would also give Klopp’s men a chance to get their title bid back on track. If Klopp’s men pull off a dramatic win, it would bring the side back on track after a series of defensive errors and lost points. Make no mistake, Jurgen Klopp is one of the best managers in the world right now. His ability to carefully constructs a side that emphasises on aggressive attack and pressing is impeccable. Using his style, he has propelled Liverpool back to the top 4 of the Premier League table and would make them a regular there. His animated enthusiasm and his pure love for his players makes him an endearing figure for one and all. Jurgen Klopp will forever remain in the history books of the clubs he has managed, specifically Borussia Dortmund, for what he has achieved during his time at the helm. There is no doubt on his abilities as a manager or his raw passion for the game. But to win more trophies, to conquer Europe and eventually stamp himself as a legend, one requires more than just heavy metal football that tends to rely on attack. His teams, a hallmark of modern day pressing, would become a complete and balanced side once the weakness is addressed. If only the defence was as strong as the Liverpool Cathedral, Anfield would once again conquer England.